The memory of a Franklin County girl shot and killed by a 12-year-old classmate lives on courtesy of a new state law. "Sienna's Law" is named for Sienna Owens, 11, who died in 2015. The law makes the punishment harsher for juveniles who are found guilty of first degree murder, second degree murder, voluntary manslaughter, criminally negligent homicide and reckless homicide. It would ensure juveniles would be committed to the Department of Children’s Services for at least a year, or until they turn 19 years old. Elaine Hughes, Sienna’s grandmother worked with state lawmakers for months to pass the law. She said she hoped it honored her granddaughter while helping other heartbroken families get closure. “I don’t want to see any other families go to court, and not see justice for their loved one,” said Hughes. Hughes said Sienna was a fun loving, generous, girl who always had a smile on her face. Her life was cut short when a classmate fired a 20-gauge shotgun and hit her in the back. She was rushed to the hospital but did not survive. Several other children witnessed the shooting. The boy was found guilty in Juvenile Court of reckless homicide and placed in state custody, where his conduct and case was evaluated every 90 days. The boy’s mother was home when the shooting happened and she was also charged in connection to the investigation. Hughes said the punishment didn’t fit the crime. Hughes said she also cried when the law was passed. She said it will help others, and that is just what Sienna would have wanted. “She would never have wanted other families to have gone through what we did,” said Hughes. 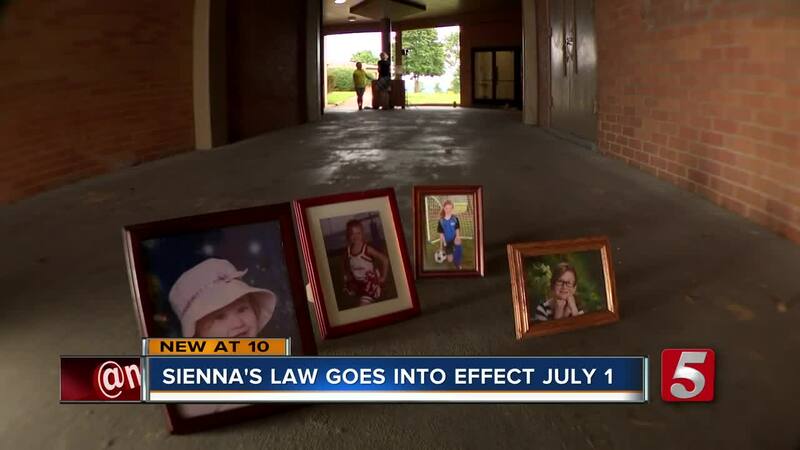 Sienna's Law is one of 150 new laws that will go into effect on July 1. Click here , for more information on other laws.